Sometimes the NWHL can feel like an arms race. Which team can stockpile the most offense? Who can assemble the most depth among their defense corps? What coach can put forth the most dangerous power play unit? By adding players into the fold, particularly during the off season, it comes down to the fact that the team having the most weaponry is the one that can do the most damage. But now it’s late in the juncture. The regular season has ended and the playoffs are just days away. What if a team could add a secret weapon that would further solidify their chances of winning the Isobel Cup? Adding a player that could become the deciding factor, and threat that other teams did not account for. 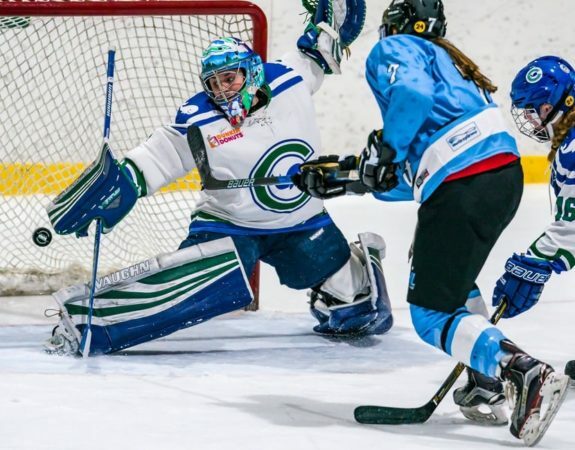 The Buffalo Beauts may have done exactly that by recently signing forward Jordan Juron for the remainder of the season. Back on Jan. 14, the 5-foot-8 Juron had joined the team for a single game on a professional tryout. It would not take the sizable forward long to contribute. 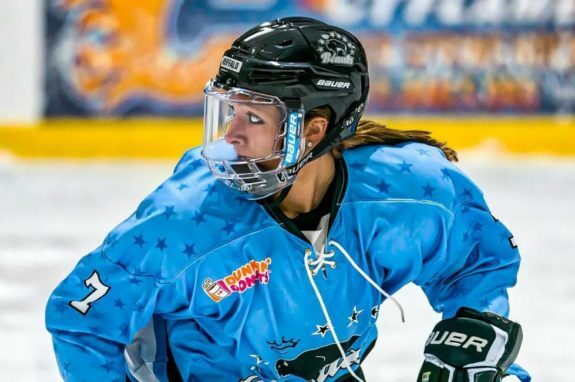 Juron picked up an assist in her first NWHL game on a tally from Beauts forward Rebecca Vint. Now, nearly two months later, she is here to stay. Word came out from the team on Mar. 8 that Juron had been signed through the rest of the season – just in time for the playoffs. THW caught up with her shortly before the Beauts regular season finale. As the season progressed, openings and opportunity came about on the Buffalo roster. Before the 2017-18 campaign even got underway Penn State’s Kelly Seward, who had initially signed with the team over the summer, sought career opportunities elsewhere and opted not to play with the team. 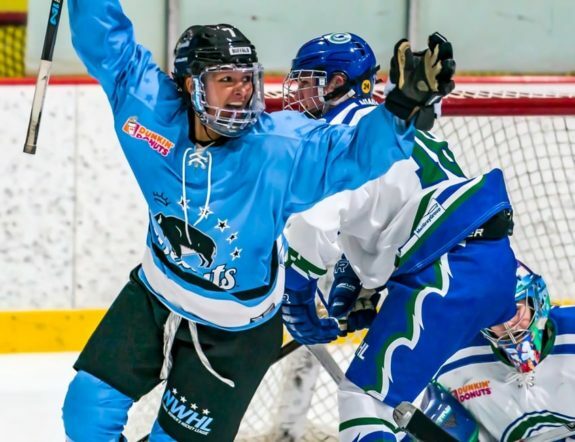 Then as seasonal play continued, the Beauts parted ways with both Jessica Sibley (two games played this year) and Kayla Parsons (three games) which opened up additional roster spots. In order to maintain their armament, it was a bit of a no-brainer for the Beauts to fill an open spot. After Juron’s solid January performance, it made sense that she would be the proper fit to make a return and strengthen Buffalo’s depth. It would not be the first time for a situation like that to happen to a professional hockey player. Still, Juron eventually got the message and joined the team for their final regular season game on Mar. 10 in Connecticut against the Whale once more. In that final game, Juron sprung for her first NWHL goal. Scoring at 7:28 of the second period, her tally held up to be the game-winner as Jacquie Greco and Taylor Accursi picked up the assists. This ensured that Juron ends the year as a point per game player through her two regular season games. 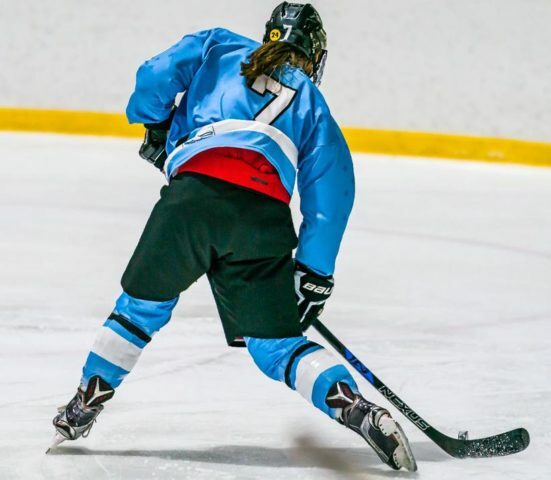 A performance such as that led to her teammate Sarah Edney referring to Juron as the Beauts “secret weapon”. Juron is certainly fitting right in too. There is always a risk associated with bringing a new player in at the end of the season. It is only natural for teams to have formed a chemistry that has grown and developed throughout the course of a year. The last thing that any coach or general manager wants to see happen is derailment because a new player just cannot connect with the rest of the team. That is not the case here with Juron. Adding to Edney’s thoughts, Juron’s own self-assessment further solidifies her place with the team. Two points in two games then seems about right. She is living up to affirmation. Juron played her college hockey at Boston University for the Terriers. Playing at the school from the 2012-13 season through 2015-16, she appeared in a 141 games. Through those four years she compiled 15 goals and 25 assists for 40 points. Better yet, she played with and against multiple Beauts teammates during here college years. The chemistry from her NCAA days has carried over into the NWHL. We could not agree with her more. Elia and Scamurra finished in a three-way tie for Buffalo’s team lead in points with veteran Kourtney Kunichika. All three players scored 14 points on the year. Entering into the playoffs Juron hopes that she can add to the scoring threat that these three snipers are able to generate. More than anything else, Juron is ecstatic over the opportunity to play professional hockey and to do so as a Buffalo Beaut. The chance to play for this team is afforded only to very few. There is certainly a sense of regality in playing for a championship-winning team. Juron is one of the newcomers striving to share in the experience for the first time, and is also hoping that she can help her veteran teammates win a second Isobel Cup. Furthermore, Juron is pumped to be an adopted Buffalonian. This is fueled even more so by the fact that the first ever home playoff game in Buffalo Beauts history will take part on Mar. 17. In the previous two NWHL seasons, all of Buffalo’s playoff games were played on the road. Finally the team will have the chance to compete in front of their own energized fans. Welcome to the “City of Good Neighbors”, Jordan – you’re its newest daughter.